Ms.Clover Trucker Husband Keychain, Drive Safe I Need You Here With Me Hand Stamped Drive Safe Gift Gift for Dad. | What Should I Say? ✺ " Drive Safe I Need You Here With Me. " Our specialties include hand-stamped pendant necklace, outdoors jewelry, party necklaces, and bracelets...that come in a variety of finishes, such as Stainless Steel, Silver, and Alloy. You'll find something that is perfect for any occasion, whether it be for bridesmaid gifts, Family gifts, best friend gifts, graduation gifts, Mother's Day gifts, Father's Day gifts, Christmas gifts, or for simply treating yourself. Sometimes it's hard when the Trucker or Driver is your Dad, Mom, Son, Daughter, or Husband. You have to say goodbye often and emotions can soar high. 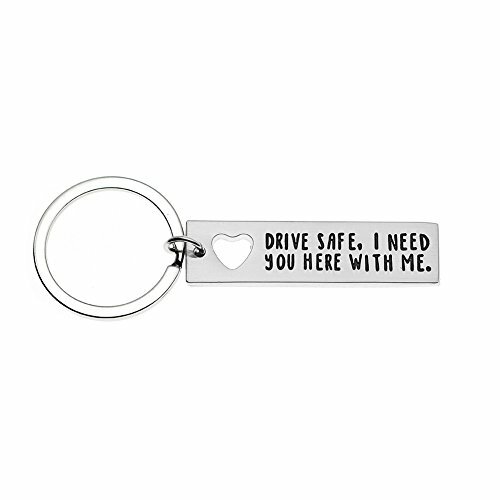 Give them this beautiful, personalized keychain to tell them that you love and always miss him - and you hope for his safe arrival back at home every time. You will constantly be on their mind and give them a sense of peace and comfort when they are away. key Chain measures 2 inches long and 1/2 inch wide. All jwelery will arrive gift wrapped in gift boxs and ready for gift giving! Everything is made by our team of awesome, . Our small business was built from the ground up based on integrity and the genuine desire to make people happy. You can trust that all our pieces are top quality, and hand-crafted by people who really care. We love our customer. If you have any questions about this product by Ms.Clover, contact us by completing and submitting the form below. If you are looking for a specif part number, please include it with your message.